Claude Parent passed away over the weekend in Paris, a day after his 93rd birthday on Friday. He was one of the most influential modernist architects to come out of France and founder of the oblique function. Parent's aesthetic style is widely acknowledged for paving the way for architects such as Zaha Hadid, Daniel Libeskind, and Frank Gehry. His style often bears the hallmark of angled walls and roofing, articulating space in such way that had not been seen before on such a scale. The oblique style was developed with the help of urban planner and cultural philosopher Paul Virilio who drew inspiration from the disorientating properties of World War II bunkers that slumped down among sand dunes, hence obscuring the threshold between floor and walls. Together, Parent and Virilio formed Architecture Principe. Notable works include Sainte Bernadette du Balay at Nevers, France. A close friend of Parent, French architect and academic Odile Decq wrote in 2005: "If someone tells you that Claude Parent is over 80, do not believe it." "His indignation is one that galvanizes and helps you to think about your dreams become possible. This drug is without any danger: it is a necessary prescription for the today’s students in architecture, fully invested in project reality but all frustrated with their dreams about tomorrow’s living," she went on to say. "Though often on the edge, his own heart never broke down, repaired by surgeries on the side road, some oblique roads, so strong and intense was the energy Claude put in it." Today, Decq added to her comments of eleven years ago. "Even if it has been repaired multiple times, last Saturday, while becoming 93, his heart has dropped off and I have lost a friend who was shaking my head to go further. See you soon, Claude!" Parent was rewarded for his contributions to architecture in 1979 when he claimed the Grand National Prize for Architecture. In 2010, he was awarded the title of Commander of the Legion of Honour, one of the highest decorations France can offer. Modernism made you mad? One remedy might be smashing your Lego model of Villa Savoye into tiny pieces. If you don't have such a model handy, there's now a virtual solution to defacing Corbu with an online game called Le Petit Architecte. https://www.youtube.com/watch?v=6nG2tOD7Ts0 Creating an “absolute architectural masterpiece” is no mean feat, but that is what players of Le Petit Architecte are tasked with achieving. 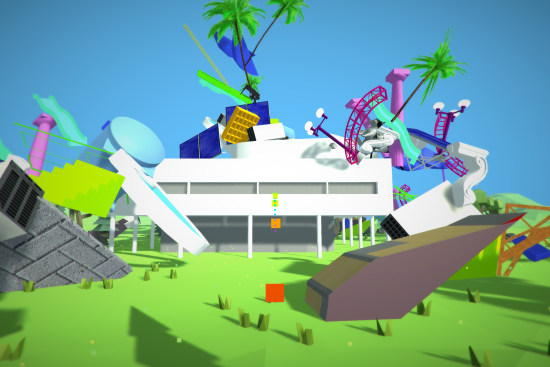 In the game, you play as an intern attempting to "improve" Le Corbusier's design for the Villa Savoye, situated just East of Paris in real life. The game comes at just over 50 years after Charles-Édouard Jeanneret-Gris' (Le Corbusier's) death which has meant that copyright in the majority of European countries (but not the U.S.) covering his work is no longer valid. Theo Triantafyllidis, a student at UCLA was one of the first to take full advantage of this. Naturally, he came to the conclusion that the first thing anyone would want to do to the Villa Savoye, if given the opportunity, would be to chuck a seemingly endless amount of objects at the house. Each object, of course, has its own sound effect which bears no relevance to its purpose size or shape or life form. An equally odd (and also perfectly befitting) soundtrack accompanies the game. The game was showcased at the #Decorbuziers exhibition in Athens, Greece late last year (on the 50th anniversary of Corbusier's death). Allison Meier at Hyperallergic succinctly stated: "Le Petit Architecte is a fairly simple game — create chaos in the face of modernist serenity. Yet it’s an enjoyably absurd diversion, and provides some digital retribution perhaps for those of us who still cringe over Le Corbusier’s mural defacement of Eileen Gray’s E.1027." 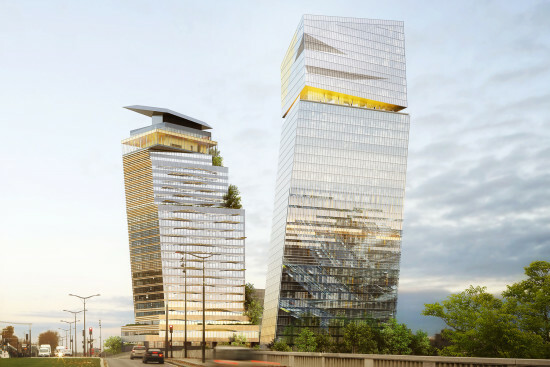 After an initial rejection by officials from the Paris Council, French architect Jean Nouvel has been awarded planning permission for his firm's so-called Duo Tower project on the Eastern banks of the Seine. 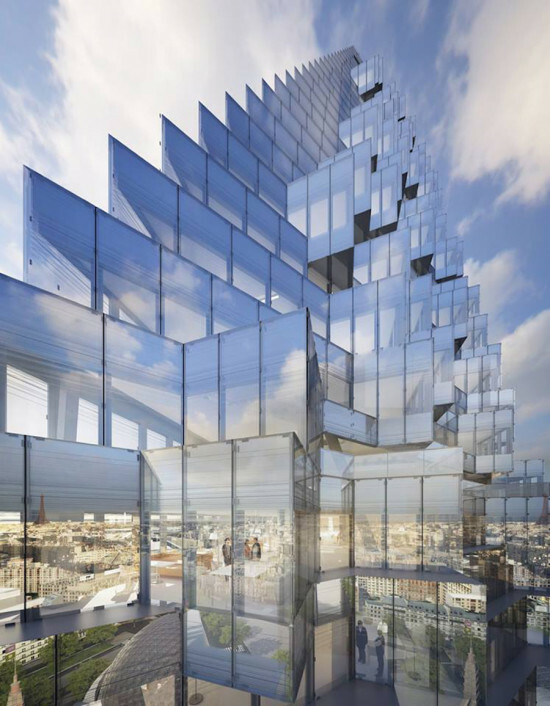 Located in the Quartier De La Gare district of Paris, the project follows on the heels of another pyramidal tower by Herzog & De Meuron planned for the city. Since Paris has dropped its construction height limit, the project is one of the first to be jumping on the high-rise bandwagon. Taking advantage of the new lack of restrictions, the taller tower will rise to 590 feet while the lower block will reach just over 400. Nouvel's towers have been a source of controversy in the French capital. 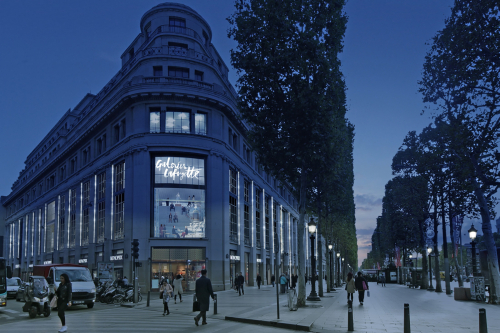 A fierce opponent of Parisian high-rises, Mayor Patrice vowed to fight the scheme earlier in the year. Speaking to Le Parisien he said "I will attack this permit with a gracious solution." Unimpressed with the towers winning planning approval, he went to on to say, "the permit/license of construction was validated on the basis of a grossly false photomontage," arguing that the renders did not accurately portray the visual effect the building would have on the skyline. Touted to cost over $570 million, the mixed-use towers will provide over one million square feet—about 24 acres—of office space, and include a hotel, auditorium, restaurant, and retail area. 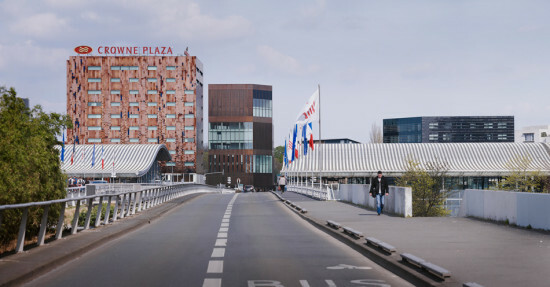 Of this space, some will be accessible to the public with the restaurant offering views over Paris and along the river. Construction is set to begin next year with the project aiming to be complete by 2020. 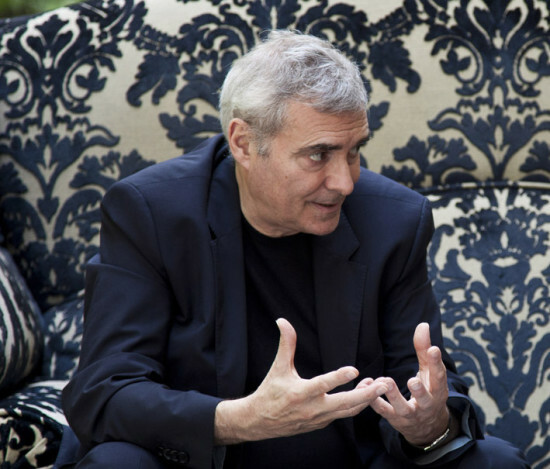 The Japan Art Association has announced that French architect Dominique Perrault, most famous for the National Library of France in Paris, has won the 2015 Praemium Imperiale International Arts Award in the architecture category. Perrault is one of five laureates, joining Tadanori Yokoo for painting, Wolfgang Laib for sculpture, Mitsuko Uchida for music, and Sylvie Guillem for theater / film. At a ceremony in Tokyo on October 21, 2015, Imperial Highness Prince Hitachi, honorary patron of the Japan Art Association, will present each Praemium Imperiale winner with a specially designed gold medal and a testimonial letter. The award also brings with it roughly $122,000 (15 million yen). 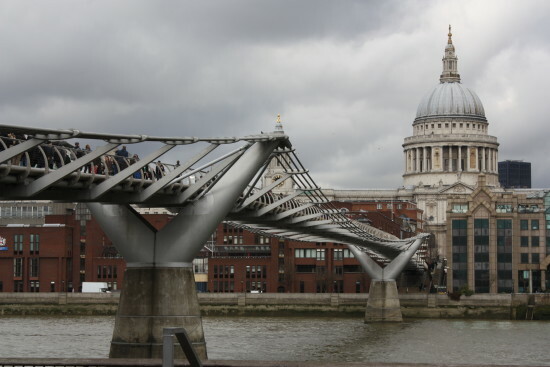 The 62-year-0ld architect “treads his own bold path,” describes The Guardian, with designs that “can be wildly imaginative … [or] … abstractly minimal.” Success is nothing new for Perrault who has already won the the Silver medal for town planning in 1992 and the Mies van der Rohe Prize in 1996. In 2010 he was also awarded the gold medal by the French Academy of Architecture for all his work. Previous winners include architects Steven Holl in 2014 and David Chipperfield in 2013. 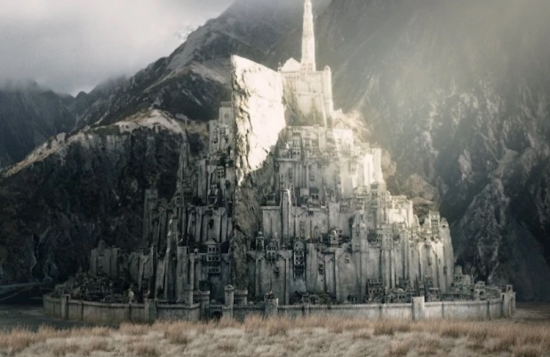 Spare a billion or two to help build a real life version of Tolkien’s Minas Tirith? There's something about those CGI scenes of Middle Earth in Peter Jackson's adaptation of The Lord of the Rings that really tickles the imagination. Apparently, they're inspirational enough to prod one group in Southern England to put together a campaign to build a real life version of J.R.R. Tolkien's hilled city of Minas Tirith. And they're asking the world to fund it. A determined group of architects and structural engineers launched an Indiegogo crowdfunding campaign seek to recreate the fictional city in all its white-walled, mountainside glory—and it won't be cheap. The so-called Realise Minas Tirith project has already raised over $94,000 of the approximately $2.8 billion budget with 47 days left to reach its goal. The project won't receive any funds unless its entire budget is met by that deadline, so it's a pretty safe bet to chip in a few bucks. 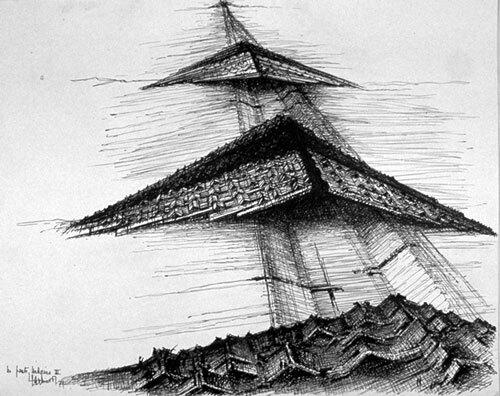 "We all share a love of Tolkien's work, and a desire to challenge the common perception of community and architecture," project leader Jonathan Wilson said on his Indiegogo page. "We believe that, in realising Minas Tirith, we can create not only the most remarkable tourist attraction on the planet, but also a wonderfully unique place to live and work.We're fully aware of the scale of our ambition, but we hope you realise just how special this project could be." If the funds are raised in time, the group plans to break ground in 2016 and open their gleaming new city in 2023. There is precedent for such a monumental hill-city building campaign. Take, for instance, Le Mont Saint-Michel in Normandy, France, pictured below. It is time to act and react. The stake is to save a major building of the 20th century…BPO’s building brought international recognition to its authors with a Golden Lion at the Venice Biennale in 1996. Their innovative approach of mixing architecture, engineering and industry in search of a new spatiality was highly acclaimed at the time. 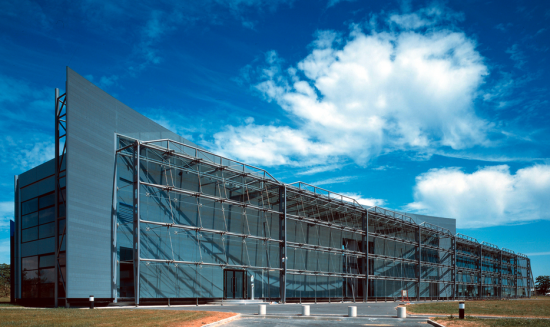 Technically exceptional with its architectural experimentations, the BPO’s building embodies the “high tech” movement at the same level as the HSBC Tower in Hong Kong or the Lloyd’s Headquarters in London. Sign up for updates to learn more at the group's Facebook page or on Twitter.